San Francisco: A huge rear wing and loud exhaust note make the 2006 Chevy Cobalt SS Supercharged coupe seem like it was designed for a teenager. Still, it drives wonderfully and offers lots of speed for the money. Pickup truck manufacturers have known it for a long time: The more customized you make a vehicle, the more customers you'll likely have. If you look at the truck lineups at Ford, Dodge and Chevy, you'll quickly realize that ordering a truck is a lot like ordering a hamburger. You can pick exactly what you want and take off everything you don't need. You can get two-door and four-door versions, two-wheel or four-wheel drive, heavy duty or light duty, and a long list of engines that range in power from lawnmower to freight train. When you count the different paint colors, optional equipment and trim packages, it seems no two trucks are exactly alike. Well, the same thing is happening with today's cars and SUVs. A few years ago the major choices might have been simply between a four-cylinder or six-cylinder engine and a manual or automatic transmission. Want a diesel or a supercharger under the hood? You might as well have asked for gold-plated toilets in place of the bucket seats. It just wouldn't happen. Here's a look at a vehicle I tested last week that puts a custom spin on an otherwise ordinary car. The normal Chevy Cobalt is a good, solid economy car known more for its price than its speed. It's just not all that exciting. But when you put in a supercharged engine and a suspension tuned at Europe's famous Nurburgring circuit, the Cobalt is anything but dull. This $21,400 car looks, feels and sounds like it belongs on a racetrack. It's bold, brash, noisy and harsh in a way that gets your heart pumping but doesn't wear you out, and its boy-racer body draws more attention than the base Cobalt's simple shape. There's a lot to like about this car, starting with its 2.0-liter engine that makes 205 horsepower. It pulls strong all the way to redline, yet it still offers lots of low-end grunt for easy passing. The stiff suspension is perfect for quick blasts down winding roads, and the solid chassis really shines in this high-performance package. There are a couple of things I don't like though. The engine seems to redline too low compared to, say, a Honda Civic Si, so I ended up hitting the rev limiter a couple of times. I also didn't care for the funky styling, which seemed to draw attention for being more outlandish than beautiful. The giant rear wing and buzzy exhaust note look like they were designed for 16-year-olds. Still, it's wicked fast for not much money, and you gotta love that. What was tested? 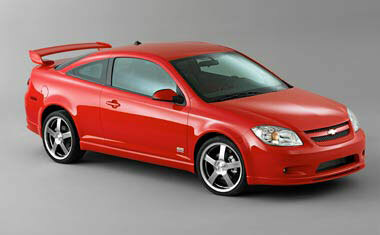 The 2006 Chevrolet Cobalt SS Supercharged coupe with a base sticker price of $21,400. Options: None. Price as tested: $21,400. Why buy it? It's extremely fast for such a low price. Its supercharged engine makes lots of smooth, even power, and the sport-tuned suspension makes it feel like a racecar.